White House Press Secretary Sean Spicer takes a question during a press briefing at the White House in Washington, May 30, 2017. After a testy 20-minute question-and-answer session, Spicer told the jam-packed White House briefing room that President Donald Trump was frustrated with the number of "fake news" stories being reported, while news about his accomplishments during his just-completed foreign tour was downplayed. "The reason the president is frustrated is that there is a perpetuation of false narratives with the use of unnamed sources over and over again about things that are happening that don't ultimately happen," Spicer said before walking away from the podium. "I think that is troubling." 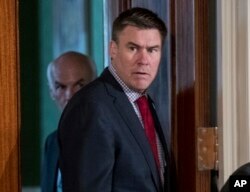 FILE - White House Communications Director Mike Dubke arrives in the East Room of the White House in Washington, April 20, 2017. The incident came hours after news that White House Communications Director Mike Dubke had resigned, in what is seen as the first step in a staff shake-up that could involve Spicer himself. Reports quoting anonymous officials say Trump is increasingly dissatisfied that the story of the administration's accomplishments is getting lost as major news outlets focus on allegations of wrongdoing swirling around the White House. "Ultimately, the best messenger is the president himself; he's always proven that," Spicer said, suggesting that Trump might take on a more high-profile role in controlling the White House message. In the meantime, however, Spicer will assume the job of interim communications director, according to multiple news reports. During the abbreviated question-and-answer session, Spicer faced tough questions on several issues, including alleged ties between key administration officials and Russia. The Washington Post reported last week that Trump's son-in-law and top adviser, Jared Kushner, had discussed establishing a secret and secure communications channel with Russia, at a time when former President Barack Obama was still in office for another month. Spicer deflected a reporter's questions about the Post's article, refusing to confirm or comment on its allegations. "What your question assumes is a lot of facts that are not substantiated by anything but anonymous sources that are so far being leaked out," the spokesman said. Spicer was also asked about the president's relationship with German Chancellor Angela Merkel, which was reported to have been strained during their meetings last week in Europe. "They get along very well; he has a lot of respect for her," Spicer said. "They continue to grow the bond that they had during the talks in the G-7." New jobs for campaign staff? The resignation of communications chief Dubke and Spicer's press briefing walkout come amid reports that the president is looking to bring in fresh blood to try to turn around his embattled four-month-old presidency. 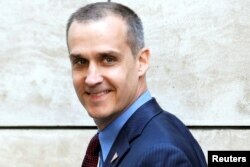 Among those said to be in line for White House jobs are Corey Lewandowski and David Bossie, political veterans who worked as senior officials during Trump's campaign but did not join the administration. Trump was reported to have met both men at the White House on Monday, as he seeks to form a "war room" to combat negative publicity and get his stalled legislative agenda back on track. He is also said to be putting together an outside group to handle all Russia-related inquiries. Many Washington political analysts see the resignation of Dubke, along with reports of tensions among the embattled communications team and the search for additional help, as signs of an administration in turmoil. Lara Brown, interim director of George Washington University's Graduate School of Political Management, says very few of Trump's staff have the skills needed to run a complex organization like the White House. "A lot of people within the White House have very little experience with government and the process of American politics," she said. Brown says one of the Trump White House's biggest weaknesses is that the president's management style is not suited to running a vast, interconnected series of organizations. "President Trump has always run his businesses in a closely held fashion, with very few individuals who have essentially managed separate projects," Brown told VOA. "That's not how politics works. Everything is profoundly connected, so you have a lot of people [in the White House] who don't understand how to maneuver through this process."